With the completion at the weekend of the Promociónes, the 2007-2008 season is now complete in Argentina. Racing, of course, are the most notable survivors of the relegations playoffs, but there have been shocks in other divisions with little-fancied All Boys winning the Primera B championship, and Nueva Chicago losing their playoff to fall down to the third flight just one year after relegation from Primera A. For all the divisional champions, promotees and relegated sides, read on. A quick reminder of the league structure: Primera A is the first division, followed by Primera B Nacional. Below that there are two third divisions: Primera B and Torneo Argentino A (the latter for sides not directly affiliated to the AFA). Then two fourth divisions: Primera C and Argentino B. Finally, two fifth divisions: Primera D and the Torneo del Interior. Movement up and down divisions is from Torneo del Interior to the two Torneos Argentinos, and from Primera D to C, up to Primera B. I’ve placed dividers between ‘tiers’ to try and make this clearer. Finally a reminder that the divisions below the top flight all operated a season-long single championship this year, so that whilst Primera A has two champions, the other divisions all have just the one. Also to the 2008 Copa Sudamericana: Boca Juniors; Arsenal de Sarandí (defending champions); Estudiantes de La Plata; San Lorenzo de Almagro; Argentinos Juniors; Independiente. Relegated to Argentino B: La Florida de Tucumán; Sportivo Patria de Formosa; Lujan de Cuyo de Mendoza; La Plata F.C. Going back to the original subject, Sam, I’ve got no idea as to how the Torneo del Interior works. I’ll see if I can find out anything. By the way…this is some great work you’re doing! I tell you what…that kind of information is not easy to find in Spanish on the regular footy websites around! Keep it up! Also…what a year for Tucumán. Both San Martín and Atlético (very big and popular sides from that lovely city of the North) have won promotion and one of them will even be back in Primera División after quite some time. You can’t say the same about Córdoba. They had a rough year and they continue to have no clubs in Primera División. A difficult time for a popular province like that. Belgrano were close to get promotion but failed. Talleres had a rough time and avoided the relegation to Torneo Nacional in the promoción at the expense of Racing de Córdoba (a team that I don’t like despite the fact they have the same name and shirt Racing have and this is because our last game in the first division in 1983 was a defeat against them and I always hated them after that match -I was 6 and you know how passionate kids can be with those things. I guess I’m still a child!). 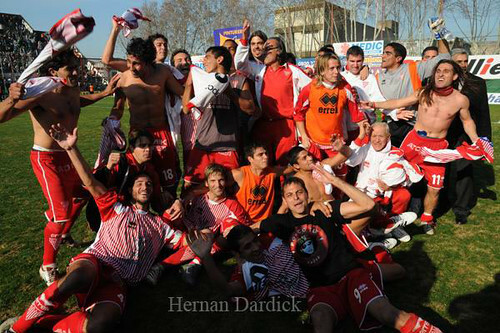 Instituto also had a horrible season and they risked relegation from B Nacional. They would have played the Promoción to avoid the drop had Nueva Chicago not being deducted 18 points because of violence last year against Tigre in the promoción. – We’ve got River and Boca AWAY. – We’ve got Independiente and San Lorenzo at HOME. – Three trips to the “interior”: the new boys Godoy Cruz in Mendoza and San Martín in Tucumán and Newell’s in Rosario. – Two consecutive home matches against potential relegation rivals: Colón and Gimnasia de La Plata (weeks 15 and 16 -it’ll be tough if we struggle as we have to visit both of them in the Clausura, so I hope we have a good Apertura and get the hell out of the relegation zone). – After those two, we visit Boca but then we receive another struggling side in Gimnasia de Jujuy. 9 points out of those three matches before and after Boca are MANDATORY! is that definitely the correct date for river boca?? Murt….I got the fixtures from Ole’s website and they put only one day for each week (even though there are matches on Friday, Saturday and Sunday). But those dates up there are all Sundays, so you can pretty much confirm that River v Boca will play October 19. Good luck on planning your trip and let me know if I can be of any help (have in mind that I won’t be in Buenos Aires from July 16 until September 18, but anything you need to ask, feel free!). thanks very much mate. I dont suppose you have enough room for 6 irish borrachos for a few weeks!!! only jokin if i can think of anything ill let you know. cheers. I’ll always have enough room for 6 irish borrachos (in my heart!) hahaha! Didn’t know you were from Ireland. Did you see this? It’s an article I posted on my blog with a link to an excellent research on the influence the Irish had in sports in Argentina done by one of Mundo Albiceleste’s readers. Many thanks for the fixtures. Will many domestic league players be called up for the Olympic squad? I would imagine, for example, River having a few and it would hamper their chances of making a good start. This also brings me to another problem with re-aliging the calendar to one championship, Feb to December. You could suspend relegation for six months, but that also means you have to suspend promotion… and Olimpo and San Martin wouldn’t be happy at having to wait at least 18 months to get back, rather than 12. Maybe they would still have promotion of two clubs at the end of the Clausura, play one last Apertura of 22 clubs in the Primera and 18 in Nacional B, and then have two up four down in the first Feb to December championship. They would have to get rid of ‘promedios’ because they would make even less sense than they do now – the average of points from the last 3 and a half seasons?! It’s annoying though that Racing will still be dragged down by all those points lost unfairly in the last six months, and can’t make a completely new start. And Seba – thanks VERY much for putting the Apertura fixtures up here. It’s genuinely appreciated (you were right, I was in bed asleep when they were published). Now that the fixture list has gone online as a ‘proper’ HEGS story, I’ve deleted your comment here so as to keep the site ‘tidy’, I hope you don’t mind. Unfortunately I can’t find any way of moving your comment about Racing’s fixtures onto the new post. And yeah, some of this info was hard to find… the AFA site was helpful for most of it but the Argentino B / Torneo del Interior changes took a bit more digging around! Now, I wonder if Seba (or anyone else ‘on the ground’ in Argentina) can explain what happens to the side who have been ‘de-affiliated’ for a single season from Primera D? From the sounds of it they’ve not been relegated as such, and are guaranteed to go back into the division (I presume certain conditions permitting) next season. So what, I wonder, is the point? Hi Sam, it’s only now that I see your last comment. Mate, I’ve got no idea as to what is the format or the organization in Primera D.
I’m guessing the point is to keep a level of importance to the fight to avoid relegation. I don’t know. I imagine it’d be very dull if there were no relegations. But again, I have no idea.